Whats the Value in playing Chess / or similar games? The site below talks about ADHD, ADD, and dyslexia and how the game of chess helped. At-any-rate, the reason I’m writing this is because if chess is that good, how much more so, when playing 3D Chess on two levels. It’s not difficult. In fact it’s easier to play and takes the same amount of moves/time to play. At the same time though, it teaches someone to think dimensionally or spacial thinking. After all the world is in 3D. 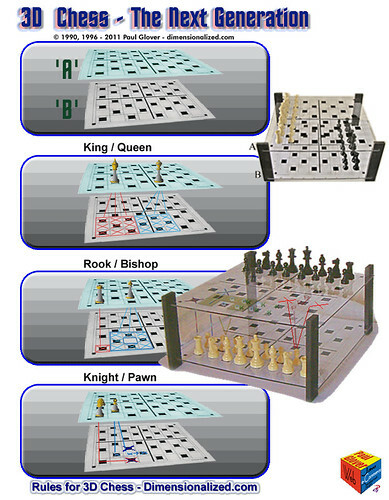 These studies would therefore also apply in part to other similar games such as Checkers and Shogi. I have a website that shows these games in 3D: dimensionalized.com/game/index.php or buy my book (10xx) which goes into much detail on how to play these games and others in 3D: stores.lulu.com (where I’m known as 3dPaul). Believe me, I’m not saying this just for the fun of it. But the above information really works. Others have said, after playing a few games in 3D, they did not want to go back to a regular flat board. You don’t have to be a master at these games to reap the rewards as mentioned in the list above.